Teaching vocabulary to an ESL class can be one of the most challenging activities a teacher has to face. When a majority of vocabulary instruction boils down to simple memorization, how does a teacher make class interesting and engaging? Here are some fresh ideas you can use with your next vocabulary unit that will help your lessons stick and allow everyone to have fun in the process, too! The next time you teach on synonyms, you might want to bring a stack of post-its to the classroom. Start by writing one word on a post-it and putting in on the front board. Then challenge your students to think of synonyms for the word. If a student offers a correct answer, he or she writes it on a post-it and places it under the first word. A second student follows. Continue trying to make the longest column of post-its possible before moving on to the next word. Reward your students with a homework free evening if they can create a column of post-its from the floor to the ceiling! If you have the room in your classroom, you might want to leave the lists up for a few days and encourage students to find additional synonyms or to use these words in their conversations and written pieces rather than the common word with which you started the activity. Beginning English learners can create their own picture dictionaries using a spiral notebook and some post-it notes. Introduce your students to some basic vocabulary, pointing out physical items in the classroom whenever possible, and have them draw each item on a separate post-it. Then, have students write those vocabulary words in their notebooks and stick the post-its over the printed words. Your students can now look at the pictures and test themselves on the vocabulary words. Once a student is confident in the new vocabulary word, he can remove the post-it from the page. Organize words alphabetically or by theme in the notebooks. You can give your students the resources to review this week’s vocabulary list at an independent learning center. All you need is a poster, some post-its and a few dry erase markers. Start with a sheet of poster paper and divide it into four sections. Label the sections words, synonyms & antonyms, sentences, and pictures. Then laminate the poster. To review a set of vocabulary words, write each word on one post-it and stick them in the first section. In the second section, students choose words from the list and write synonyms or antonyms on a second post-it. In the third section, students choose other words to use in sentences, which they also write on individual post-its. Any words that are left go in the last section, where students draw a picture illustrating the meaning of the word. By the time your students finish all three sections, they will have reviewed all of the current vocabulary words. Do you have vocabulary lists that change on a regular basis? You can use post-its to create a permanent bulletin board for new vocabulary words and save yourself the effort of changing the board each week. Simply put this week’s words on post-its and stick them to your permanent display. When test day rolls around, you can simply take the notes down and display next week’s words on a new set of sticky notes. Vocabulary improvisation can be a fun and lively way to review vocabulary with your students at the end of a unit. Break students into groups of four to six for the activity, and make sure you have one or more vocabulary words for each person in the group. To review a word, write it on a post-it and have one student in each group place the note on her forehead. The other students in her group should act out the definition of the word. She must interpret her classmates’ actions and guess the vocabulary word that is on her forehead. Once she does, another student wears a new word and the game continues. Your students will have so much fun with the silliness and energy that this activity promotes, they may not even realize they are learning! Vocabulary review does not have to keep your students in their seats. This relay race will have your students racing to learn their vocabulary words for the week. Using a large piece of poster board, create a grid which will serve as the answer board for your vocabulary review. Write one word on each post-it, and place them in the grid. Then divide your class into two teams and have them line up. Give a fly swatter to the first person in line and place the answer grid on a flat surface in the front of the room. To review the vocabulary words, show your class a sentence which can be completed using one of the vocabulary words. You might want to prewrite them on poster board, put them in a power point presentation or use an overhead. Once students see the sentence, they race to the vocabulary choices and swat the correct answer. The first team to choose the correct word gets to place that post-it on their side of a scoreboard. As you give additional sentences, the choices become fewer. Play until all the words are used, and then declare the winning team. You can also do this activity using synonyms, antonyms or definitions of the same set of vocabulary words. 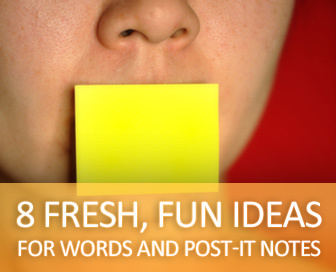 Your students will enjoy playing vocabulary dash with a set of post-it notes. This game reviews any vocabulary with physical representations in the room, for example items in the classroom or body parts. Put students into groups of three students, and give each group a stack of post-it notes with the vocabulary words on it. Then, give the groups thirty seconds to stick the notes on the correct objects. (Note: if you are reviewing body parts, have each group choose one member to be the model and have the words stuck to them.) As your students get better at the game, reduce the amount of time they have to post the vocabulary. They will enjoy the excitement and energy this game creates in the classroom. The next time your ESL students tackle content or cover a particular theme in class, let them contribute to the unit’s content with a vocabulary treasure wall. On a section of wall in your classroom, create a treasure area. You can cut a treasure box out of poster paper, draw a pile of treasure on a large poster board, or be creative in how you designate your area. Then, as your students go through their studies and days, encourage them to note any new words that relate to the subject you are studying. For example, if you are doing a unit on baseball, your students might find the words homerun, umpire or World Series. Have any student with a word treasure write that word on a post it. On another post it, he should write the definition, draw a picture, or put down anything else that will help him understand the word. Once those post-its are done, he can put his discovered treasure in the treasure pile. He should first stick the definition note somewhere on the pile. Then, he should stick the note with the vocabulary word on top of that definition. The rest of the students can look at these treasures during free study times, and your class will feel like they are taking some control in what they learn in class. Words really are fun, and your ESL students will get a glimpse of that with these vocabulary activities. They are simple, straightforward and fun. On top of all that, they work, so grab some post-its and see just how much a sticky note can help your students learn!